The Dude certainly had the right idea. 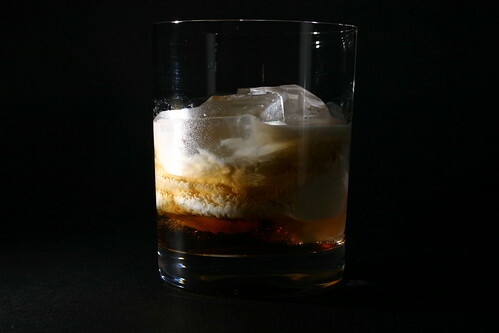 The White Russian is truly a tasty cocktail. There isn’t a huge amount of room for experimentation here so I’m going to leave this one mostly up to the drinker. That said, I do have a few bits of advice. One – Branch out from your normal coffee liqueur. There are others out there and as you saw in my rave review of Corretto, some of them are really spectacular. Two – Change up the ratio. Switching things up allows you to control the level of sweetness, richness and flavor levels in this drink. This will be especially necessary if you choose a different liqueur that may not have the same sugar content as Kahlua. Three – Finally, not all cream is created equal. I’ve been using table cream for my drinks and find it to be the right choice. Heavy cream has an even higher fat content and will make your drink even more rich, which isn’t necessarily a good thing in this case. Half and half is an okay choice, but it’s lower in fat than table cream and may make your drink a bit watery. So there you have it. My brief commentary on the White Russian. Enjoy! In desperation I have used skim milk supplemented with two spoonfuls of Cool Whip. Shaken, the consistency evens out and it comes out not half bad. The Dude abides. Given some solid shaking I think that could actually make a passable drink. Strong work on that one!